This compelling book destroys the derogatory images of single mothers that too often prevail in the media and in politics by creating a rich, moving, multidimensional picture of who these women really are. Ruth Sidel interviewed mothers from diverse races, ethnicities, religions, and social classes who became single through divorce, separation, widowhood, or who never married; none had planned to raise children on their own. 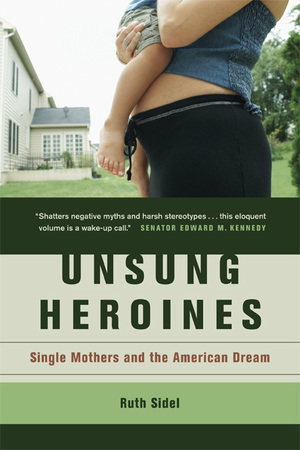 Weaving together these women’s voices with an accessible, cutting-edge sociological and political analysis of single motherhood today, Unsung Heroines introduces a resilient, resourceful, and courageous population of women committed to their families, holding fast to quintessential American values, and creating positive new lives for themselves and their children. What emerges from this penetrating study is a clear message about what all families—two-parent as well as single parent—must have to succeed: decent jobs at a living wage, comprehensive health care, and preschool and after-school care. In a final chapter, Sidel gives a broad political-economic analysis that provides historical background on the way American social policy has evolved and compares the situation in the U.S. to the social policies and ideologies of other countries. Ruth Sidel, Professor of Sociology at Hunter College, is author of many books including Keeping Women and Children Last: America’s War on the Poor (revised edition, 1998) and On Her Own: Growing Up in the Shadow of the American Dream (1990).